A new phrase has entered our energy lexicon—peak oil demand. 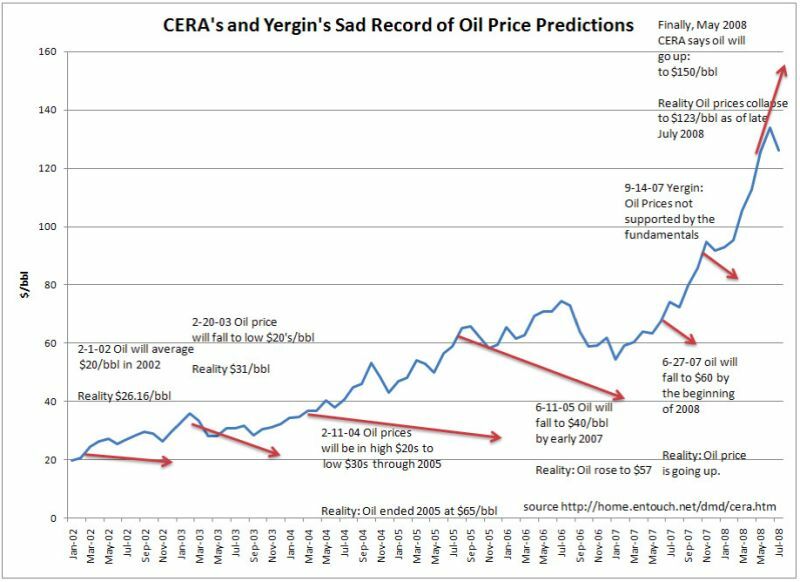 The essential idea: prophets of doom who warned about a looming global petroleum shortfall (“peak oil”) were wrong; instead of a downturn in supply, we’re instead seeing the shrinkage of demand for oil. A non-problem just solved itself! Nothing to see, folks; move along. What’s wrong with this framing of our energy situation? Plenty. To understand what and why, it’s helpful to start with a sense of who’s crooning the “peak demand” tune: it’s long-time peak oil critics like Daniel Yergin—the oil industry spokesman who, throughout the past decade of soaring oil prices, repeatedly assured the public that prices were going to fall back to historic levels (he was wrong each time, see here and here.). The industry hates peak oil, because if people took it seriously there would be a mad rush by individuals and governments to reduce petroleum dependency. Can’t have that. Is it true that demand for oil has fallen? Yes—and there’s the kernel of truth from which “peak demand” has sprouted. In the older industrial nations—principally, the US, Japan, and Europe—oil consumption started moving sideways-to-downward around the time of the 2008 financial crisis. In fact, if US oil demand had continued its historic upward trend (about 1.5 percent per annum), it would be about 20 percent above the actual current level. Americans are buying hybrid cars and electric vehicles, and manufacturers are engineering traditional gasoline engines to be more fuel-efficient. The average fuel efficiency of new cars in the US is at its highest level ever. Fair enough. But that’s far from being a sufficient explanation for the demand destruction we’re witnessing, given that relatively few Americans are buying new cars these days. In fact, the biggest single component of contraction in US oil demand is drivers clocking fewer miles annually. The past five years have seen the longest sustained period of non-growth of vehicle miles traveled (VMT) in US history. Why aren’t people driving more? Two words: gas prices. Incomes for most Americans haven’t improved in recent years, but gasoline prices are hovering near their highest level ever. Driving has gotten so expensive that attitudes toward automobiles are slowly changing, with many young people abandoning the very idea of car ownership. However you look at the recent decline in petroleum demand, stratospheric oil prices are clearly implicated (it’s not just parsimony in miles driven; efforts to boost fuel efficiency are also largely motivated by gas pump sticker-shock). But why are petroleum prices so high? Although some commentators are quick to blame oil companies or speculators, the main factor keeping the price of oil above $100 a barrel is supply. Yes, OPEC frequently reminds us that the oil market is “well supplied.” But that claim requires an addendum: the market is well supplied with $100 per barrel oil—which the economy can barely afford. If the oil price were to slip southward, back to historic levels (closer to $40 per barrel, adjusting for inflation), the number of barrels of petroleum available worldwide would quickly dwindle. That’s because the amount of oil that can be produced profitably at a low price (typically from onshore, conventional, vertical wells) has fallen in recent years. All new demand has been met with oil from marginal, expensive sources—tar sands, horizontally drilled and fracked tight oil wells, or deepwater wells. Producers need prices of $100 a barrel to justify investing in these operations. The oil industry has doubled its level of investment in production in recent years, and doubled the number of wells it drills annually, while taking on far more debt—just to grow total oil supply at an anemic rate. So the correct framing of our situation is this: Falling production of conventional oil is pushing prices higher, and high prices are driving demand down. “Peak demand” is peak oil by another name—de-fanged and de-clawed. Euphemisms don’t change reality, except by first changing people’s perceptions of reality, and hence their actions. Here’s reality, stripped of niceties. Oil is the lifeblood of industrial society, since nearly all transport fuel is oil-based and transport is essential to trade. Industrial nations have no ready and adequate substitute for petroleum. Therefore, unless preparations are made, the inevitable decline in global conventional petroleum production will gradually strangle the world economy, starting with the most oil-dependent nations. Production rates of conventional oil will decline more sharply as time goes on, making it harder with each passing year to keep total liquid fuel production steady, harder still to grow it. As long as prices remain high, increasingly desperate efforts to slake society’s thirst for liquid fuels will lead to the exploitation of more costly substitutes for conventional crude, such as tar sands—but these sources also happen to carry more environmental costs and risks. Problem not solved. The currently favored “fix” for the dilemma of conventional oil depletion and decline—tight oil from North Dakota and Texas—is in the midst of a short-term boom. But the supply boom won’t last until the end of the current decade, and a demand bust could foreclose this expensive option even sooner. All the “peak demand” discourse actually accomplishes is to lull society into inaction. Why worry? The market is solving our problems for us. There’s no need to actually do anything—like retool our economy for less mobility, less growth, and more renewable energy. Peak oil? It’s doing just fine, thanks. As for our oil-dependent economy, not so much.